Our man Adrian Baggaley scooped the prizes again this year at the Royal Horticultural Society Tatton Park Show with fourteen first prizes out of his total of seventeen entries! 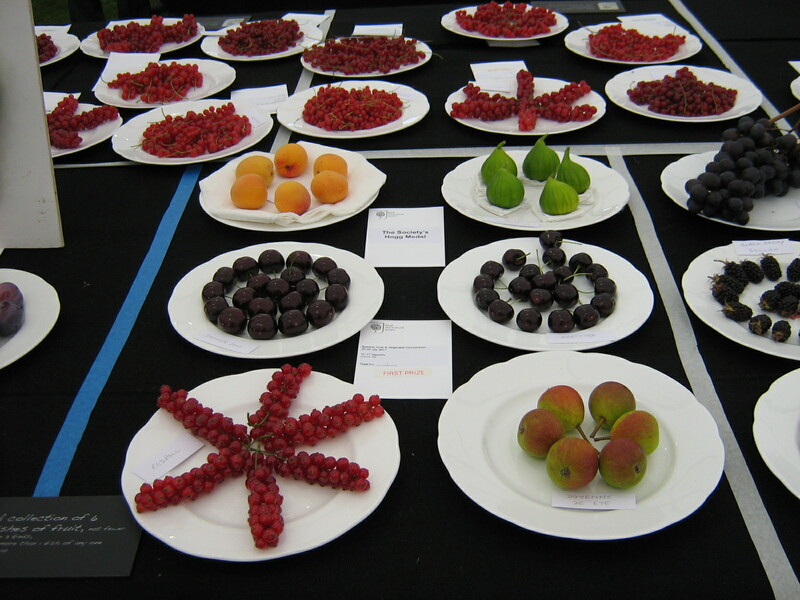 He took the prize also for the best single dish of fruit in the show with a plate of Redpoll red currants. For the third successive year he won the Hogg medal for a collection of six dishes of fruit – Doyenné De Eté pears, Rouge Tardive apricots, Summer Sun Cherries, Hertford cherries, White Marseilles figs and Redpoll Red currants. And what must be a first in a July show exhibited a prize winning dish of Discovery apples. 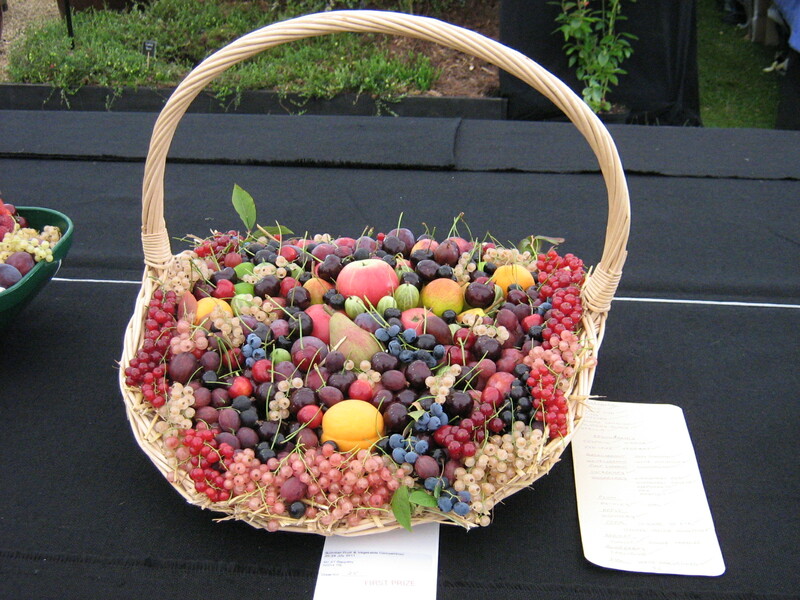 His basket of fruit was also a treat although it seems that the RHS has decided that in future everyone must use a standard green plastic trug for this class and not go for any showy receptacles! Although I grow fruit successfully at 60m (200ft) altitude within 5 miles of the coast in south east Scotland, I have an opportunity to plant some former grazing land at 240m (800ft) near the Tweed/Clyde watershed. Does anyone have experience of fruit production in such a challenging environment? Any useful fruit crop would be considered, such as elder, blueberry, bramble, although I want to achieve more than a feast for the local wildlife! All suggestions welcome. 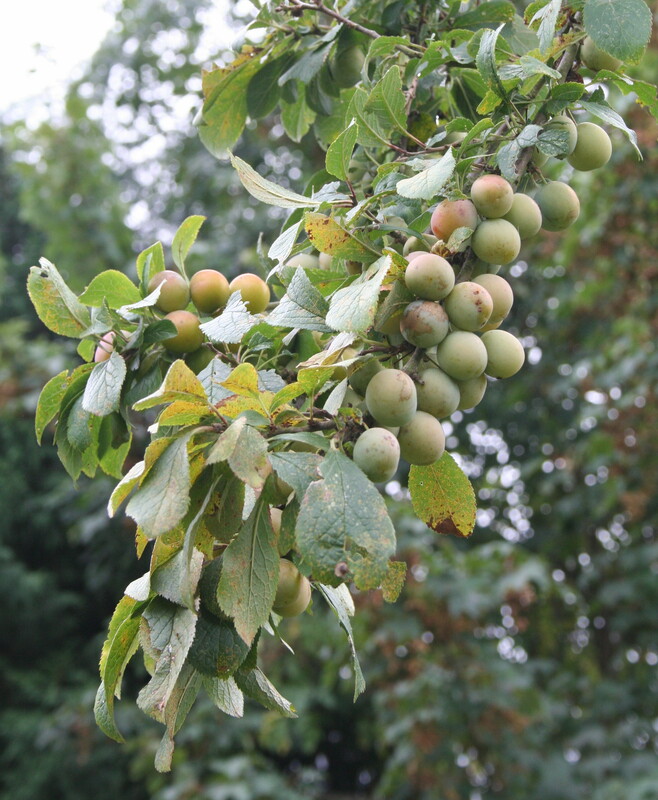 The Essex Bullace – information please? I am trying to find information about the Essex Bullace and, if possible, obtain a tree. An internet search has thrown up a couple of references. The Essex Bullace fruit is said to have green/yellow skin and be larger than the common White Bullace. Does anyone have knowledge of this variety please? Shepherd’s Bullace is believed to be the Essex Bullace, see comment below by Paul Read. Greengage tree – what is the new growth coming up in the ground? A few years ago we bought what was supposed to be a Victoria plum at Liddles. It grew and grew and when it eventually fruited we realised that we had a Greengage and very nice it is too. The query is about a new growth coming from the ground about two feet from the main trunk. It is definitely a new Greengage tree going by foliage but we do not know if it is coming up as a seedling or is it coming from the roots of the original tree. It is quite a strong growth and if possible we would like to save it as we were once told by some men on a fruit stall at Gateshead Show that there were not many Greengages around and that we were lucky to have got that one. What we would like to know is which of these you think it may be and whether it is worth saving to grow in another part of our allotment? Will it bear fruit and will they also be like the ones from tree we already have?